NETLAB+ comes with over 600 proven IT labs developed in partnership with leading vendors and aligned to industry certifications. This makes it easy for programs to offer and deploy a wide range of curriculum covering today’s most in-demand technologies. With NETLAB+, users are able to access IT labs 24/7, from anywhere with an internet connection. Program administrators appreciate this capability because it dramatically increases the utilization and ROI of their IT infrastructure. And students love it because it makes it easier to fit labs into their busy schedules. 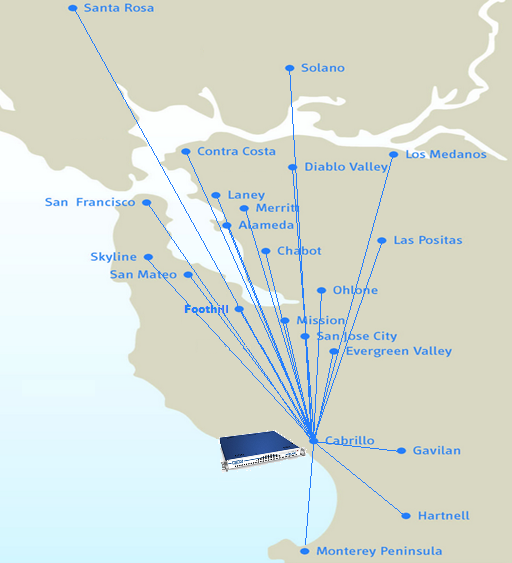 In 2015, six of the 24 BACCC community colleges joined forces to apply for a State of California grant to transfer all of their IT lab equipment to a centralized data center at Cabrillo College. “The savings to the region have been pretty significant,” Grotegut notes. He estimates that collectively it would have cost the Bay Area community colleges $3.6M to build similar IT lab facilities, and much more to manage them. With the consolidated facility, BACCC was able to hire a full-time data center administrator, which enables instructors to focus on teaching rather than maintaining and upgrading infrastructure. And with NETLAB+, there’s so much more content available for them to teach. Bay Area community colleges aren’t the only ones benefiting from the new IT lab facilities. BACCC has occasionally provided access to colleges in other parts of California and local high schools. BACCC also supports the local Cyber Patriot program, which enables high school students to develop and test their cybersecurity skills. “The problem with industry is that 70% of the jobs—at least when you look at the job boards—require a bachelor’s degree. Even though it’s really the skills they’re interested in,” he observes. Capable of accommodating 320 simultaneous connections and up to 17,920 individual 3-hour lab sessions during a 24/7 week, the BACCC’s NETLAB+ system has ample capacity to support more students, colleges and curriculum. Read the case study to learn more about the cost savings BACCC achieved using NDG’s NETLAB+ system.